Happy Monday my friend! BOOM meatless Monday, loving it. STOP!! 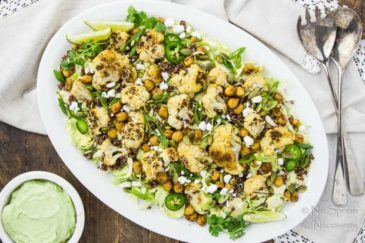 How did you know I’m in L-O-V-E with chickpeas! I can eat an entire can of chickpeas in one sitting. 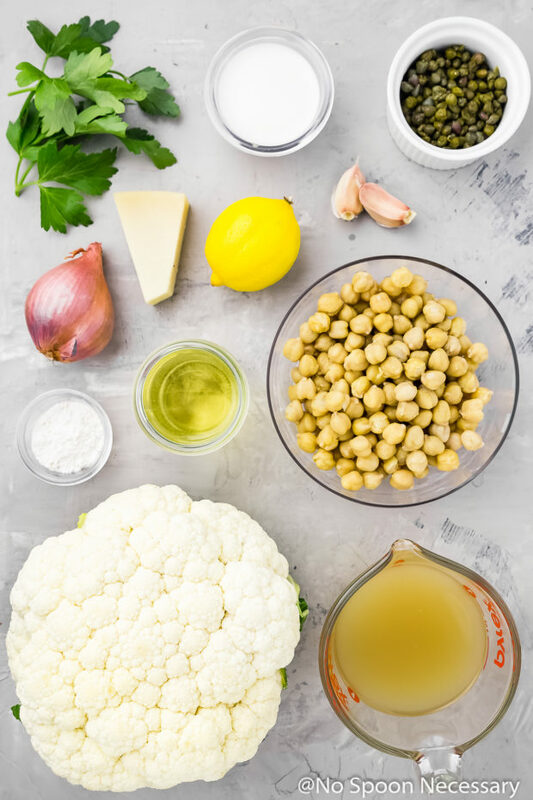 I also like the idea of a veggie piccata, I’ve never had piccata because it’s always made with chicken and I don’t eat chicken. I’m drooling over here! 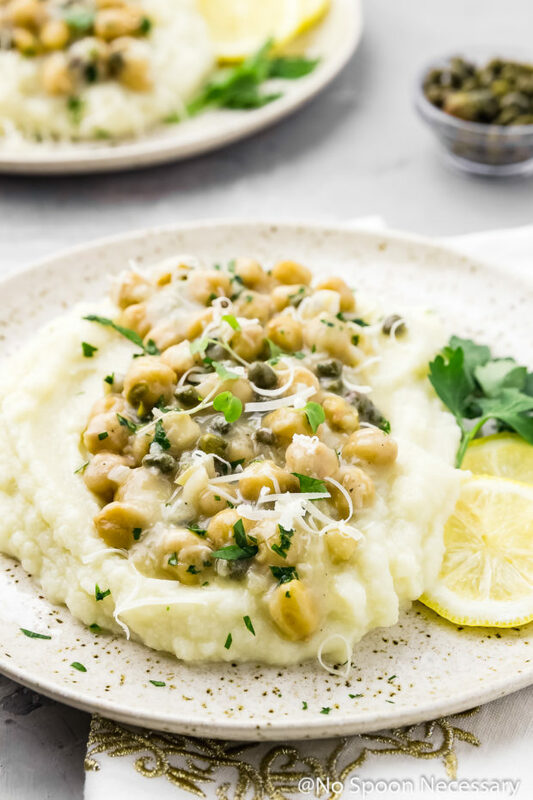 OH WAIT… Cauliflower mash, you are killin it Cheyanne. The weather has been crazy around here, too! 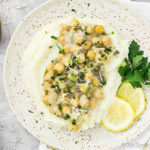 Love the idea of chickpea piccata! Looks amazing! And cauliflower mash is my favorite! Pinning to try it! I’ll admit, chickpeas have NEVER tempted me like they’re tempting me now! SERIOUSLY yum. I am totally the same way, and I am like a good month behind on when everyone is posting the holiday recipes. I saw some Easter recipes in the middle of FEBRUARY. I can’t get on board with that. THIS, yes. 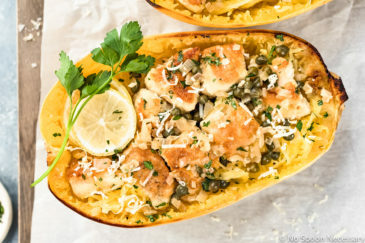 I’ve always been a big fan of chicken piccata and we’re totally on the same wavelength because I have it on my editorial calendar to do with cauliflower steaks. 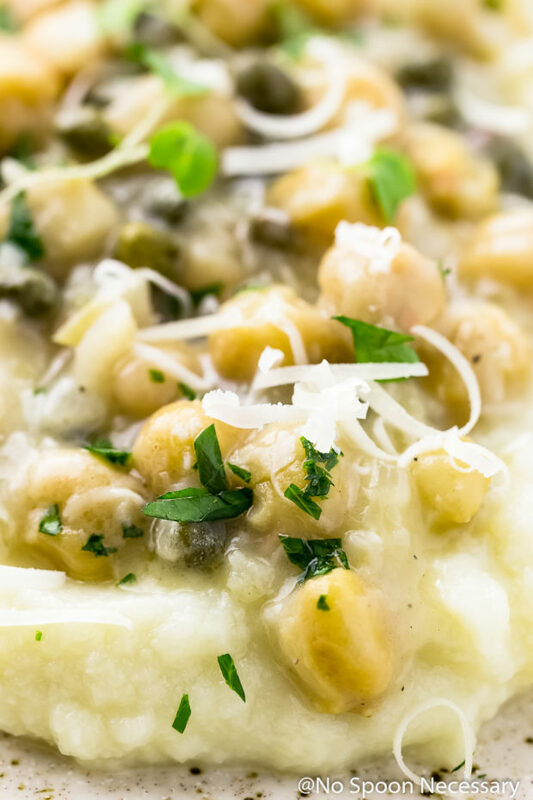 But I love how you’ve imagined it as a healthy hearty bean dish over cauli-mash. Looks so darn good. 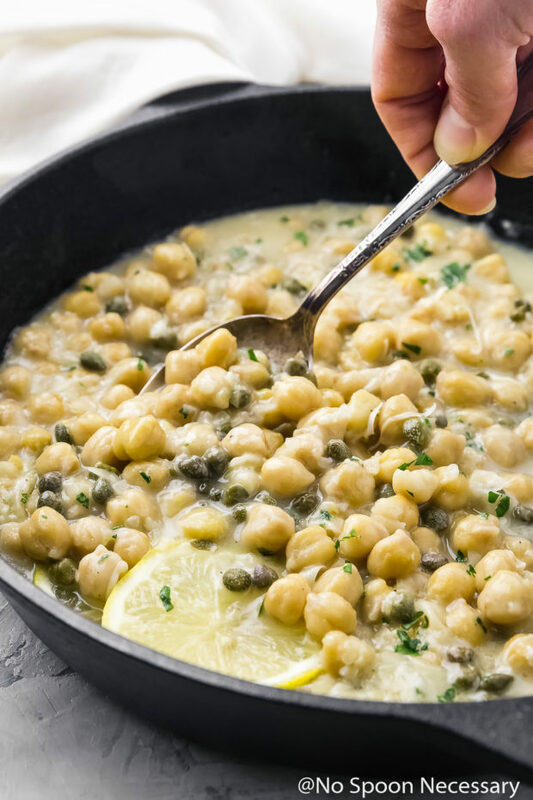 You’ve proven piccata doesn’t need any chicken — this looks even better with the chickpeas! 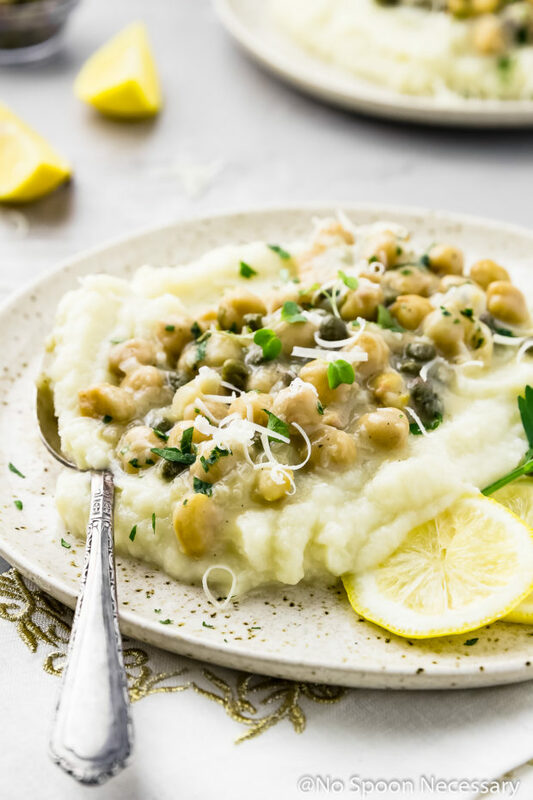 This is a gorgeous Meatless Monday meal, and that cauliflower mash looks incredible! I truly want to change my dinner plans! This is a fantastic idea. LOVE it. What a delicious idea!! Who doesn’t love piccata?? Even as a carnivore, I could totally get behind this version. And yes… this weather has been sooo crazy. I was convinced spring was here and then this weekend got beyond freezing again 🙁 Thank goodness for daylight savings time time next weekend!! Wow, Cheyanne! 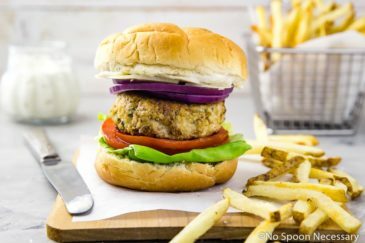 I’m so in love with the veggie twist on a classic dish. I’m totally down with the cauli mash. Totally gonna try it out. Hahaha – I wasn’t thinking that you “cluck as a second language” but now I am!!! 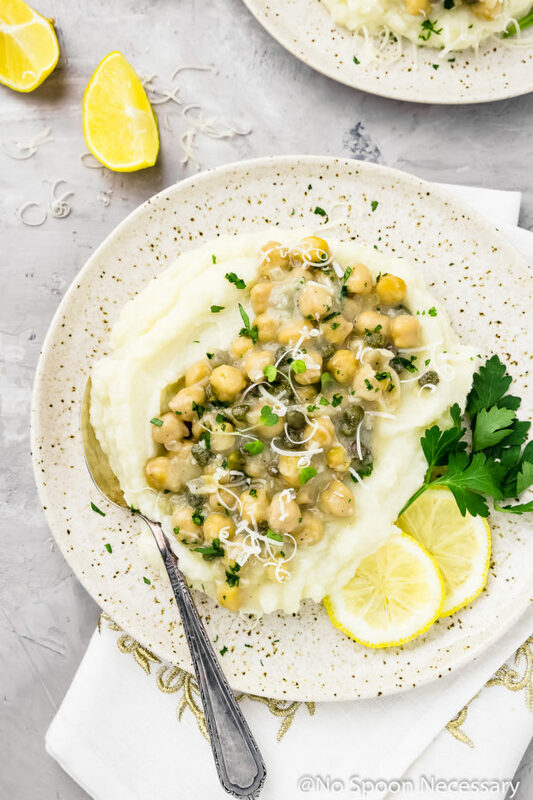 BTW – Cheyanne, you made this Chickpea Piccata with Cauliflower Mashed ‘Potatoes’ just for me – right? 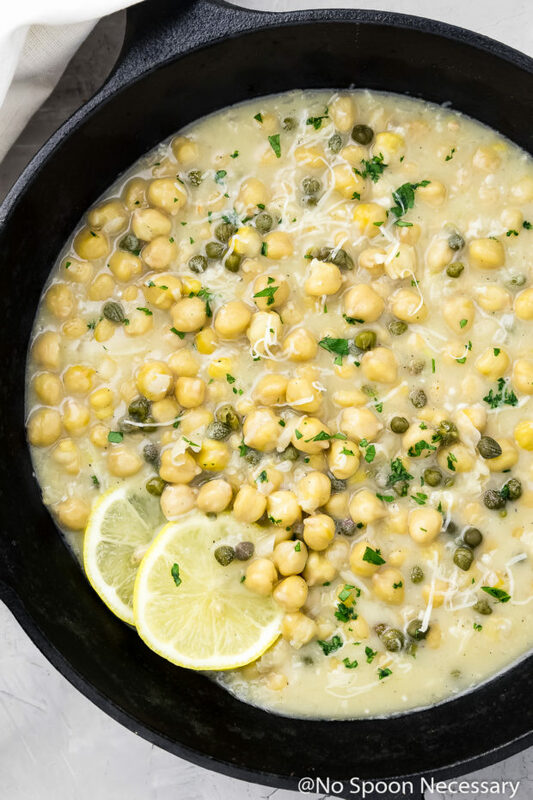 I’ve decide to give up meat just for lent and this is my kinda eating – though, tbh, I don’t think I’ve ever had Piccata in any form – but it sure sounds wonderful! I totally agree Chey! Meatless Monday never looked so good. What an awesome idea this is. Once again your creativity is over the top. I don’t think Tom will go for the chickpeas, so this one’s all mine! Can’t wait to get this one on the menu! This weather is definitely wacky! It snowed just a teeny bit on Friday night, and it was such a let down for everyone, after having such warm temps earlier in the week. Hooray for meatless Monday! 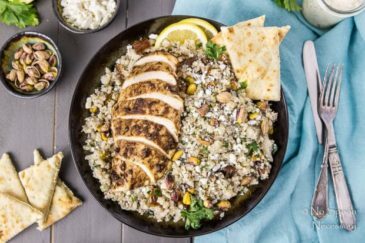 I love how you left out the chicken and added chickpeas…SO creative, Cheyanne! And that cauliflower mash sounds sooo good. I’ve been seeing tons of cauliflower recipes lately, so that really intrigued me. What a perfect meal to kick of the week! Happy Monday, friend! Hahahha ohh Cheyanne, I love your writing style! I can now totally picture you clucking as a second language 😉 So, I first of all have to admit that I had NO IDEA what piccata was. I even google translated it into Dutch but that didn’t change anything… So thanks for teaching me something new! It sounds totally delicious and since I don’t know this dish with meat I’m sure I won’t mind the meatless version at ALL. It looks totally creamy and yummy. 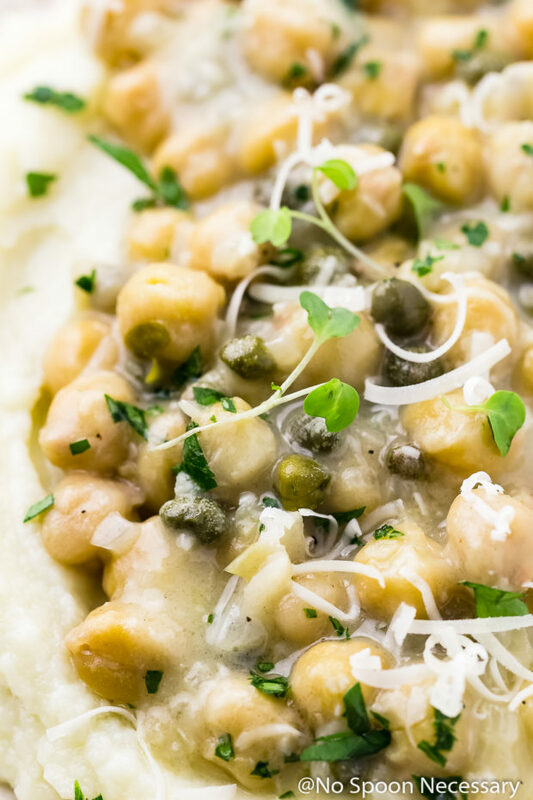 I had chicken, pork and even tofu piccata before…but chickpea? You are a genius, Cheyanne. Looks sensational served on that bed of cauliflower mash, which happens to be my favourite too.